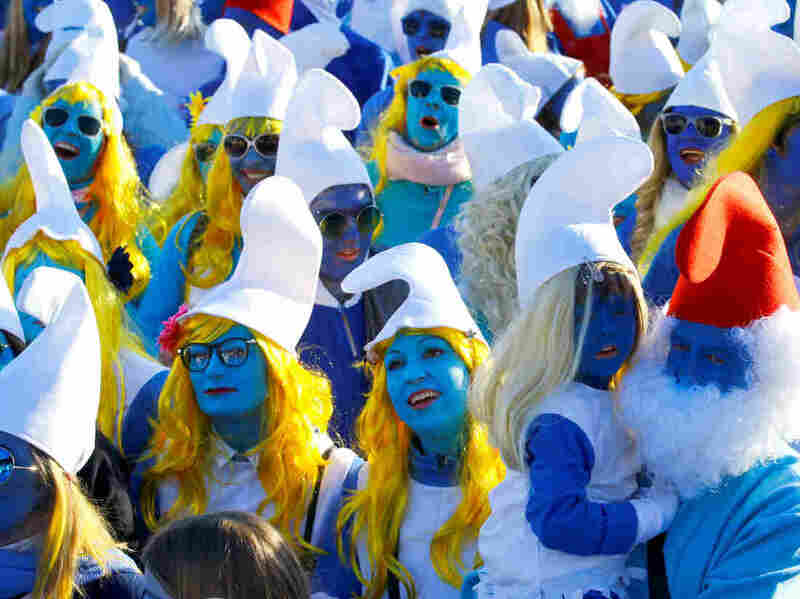 German Town Sees A Smurf Invasion, As Thousands Gather To Break World Record Almost 3,000 people painted their bodies blue and gathered in Germany in hopes of setting a world record on Saturday. Participants dressed as Smurfs gather in an attempt to set the record for the world's largest meeting of Smurfs in Lauchringen, Germany, on Feb. 16, 2019. They came covered in blue paint, donning red and white hats, nearly 3,000 in all. Their goal was simple: To break the world record for the largest group of people dressed as Smurfs. The group Dä Traditionsverein organized the event in Lauchringen, Germany on Saturday near the border with Switzerland. They had strict rules: in order to be counted, participants couldn't show any non-blue skin. They could dress as Papa Smurf — with his trademark red cap and a white beard — or Smurfette, with blonde hair and a white skirt or dress. Normal smurfs were OK, too — but some characters, like the evil wizard Gargamel, were strictly off limits. The group posted on Facebook that 2,762 Smurfs showed up. The Record Institute for Germany verified that number on its website. They've even provided a certificate for participants. Guinness World Records has yet to confirm the feat. The standing record is held by a group of 2,510 people in the United Kingdom in 2009. Dä Traditionsverein first attempted to break that record in 2016. The gathering isn't the only smurf-themed record that Guinness keeps tabs on. With a total of 6,320 items, Gerda Sheuers of Ripon, Wisconsin set the record for the largest collection of Smurf-themed memorabilia in 2014.